Schadenfreude is a powerful emotion, but is it strong enough to get you to watch two documentaries on the same subject? This week sees the release of dueling documentaries about the notorious Fyre Festival, the wannabe luxury music fest put on in the Bahamas that briefly took social media by storm when it collapsed into chaos in the spring of 2017. Attendees arrived to the fest only to find a gravel-filled construction site in shambles, repurposed FEMA tents in place of their promised luxe cabanas, and no way to escape. While some simply reveled in the imagery of privileged young people discovering they had paid thousands of dollars for the opportunity to temporarily experience life as refugees in a disaster zone, the flood of behind-the-scenes detail that soon became public exposed the event as the definition of hubris, a project of Sisyphean proportions manifested into jaw-dropping reality by an arrogant confidence man. Netflix has Fyre; Hulu has Fyre Fraud. Both are roughly 90-minute documentaries laying out just went wrong in glorious, salacious detail. But if you have to choose only one to watch, Fyre is the better film—though given the additional layers of intrigue surrounding these films, there’s an argument to be made they work better as messy halves of a PR-damaged whole. In response, Furst brought up a point made toward the end of his own film Fyre Fraud (co-directed with Julia Willoughby Nason): namely, that Netflix’s Fyre is produced by Jerry Media and Matte Projects, the very companies also responsible for promoting the Fyre Festival. “I feel like there’s a bigger ethically compromised position,” Furst said, “and that’s going and partnering with folks who marketed the Fyre Festival and were well aware that this was not going to happen as planned.” While neither side comes out looking especially great in this battle of who-stooped-lower, it’s not exactly a revelation that most documentarians at one time or another are forced to make dicey calls about their own role in telling a story, getting their sense of morality a little blurred in the interest of capturing some larger truth. Both movies fail to disclose their own complicity in their subjects, which is on them. Whether it’s worth it depends to a certain degree on the result—neither film is flawless, but the strengths of each help fill in the blanks of the other. Ultimately, where Fyre excels over Fyre Fraud is Smith, a director with a razor-sharp point of view and eye for crafting a narrative that captures surprising, small moments of human foibles amid all the madness. (His résumé includes American Movie and 2017’s Netflix doc Jim & Andy: The Great Beyond.) Smith knows just how outrageous this story is, and lets his narrative be guided by the inside scoop from his parade of subjects, nearly all of whom witnessed firsthand this slow-motion train wreck of a music festival as it unfolded, whether as part of McFarland’s handpicked team of event producers or the luckless folks tasked with carrying out various aspects of his impossible vision. He expertly weaves in footage shot throughout the project’s lifespan, from grandiose pronouncements of the festival’s soon-to-be-greatness from “possibly complicit, possibly a sucker, likely a bit of both” McFarland partner Ja Rule, to little moments that perfectly capture the cynical mindset behind McFarland’s opulent Instagram-ready fantasies. (During an early business meeting, the con man explains the appeal of Fyre Fest: “We’re selling a pipe dream to your average loser.”) A rueful discussion with festival planner Marc Weinstein is a highlight, as the man relays each disastrous step he saw coming, yet frets about his own complicity in continually trying to fix it all rather than cutting ties and running. What Smith nails is just how far McFarland’s bravado and snake-oil salesman shrewdness really took him before it all collapsed. By getting a bunch of the world’s biggest social media stars to promote his event for him, McFarland exploited the value of influencer culture in a way not many have. Despite a few closing minutes that pose generalities about the “Instagram lifestyle” that hoodwinked so many attendees in the first place, the film doesn’t need to make any larger points about the branding of millennial identity or how social media has changed the nature of grift—his stranger-than-fiction tale does it for him. By contrast, Fyre Fraud (Grade: B) is interested in the macro story of What It All Means. While directors Furst and Nason actually provide a more traditional, almost biopic-style account of McFarland’s life, they want to use it to say something meaningful about the way social media distorts and weakens millennial culture, and that push for gravitas ends up hampering the film with a tone that at times comes close to a blithe dismissal of contemporary youth. It’s admittedly fun to include a smirking takedown of self-professed influencers—who, when pressed to define what they mean by their “brand,” end up stammering out a few words about positivity, as though they’d never considered the question before—but it gets awfully glib. Fyre Fraud has cultural critics like The New Yorker’s Jia Tolentino weigh in on how the festival debacle can be seen as a symbol of modern identity, but given these people’s total distance from the actual events of the film, it never gains much traction. What the film does have, though, is McFarland himself. Before he was sentenced to six years in jail for fraud, he sat down with the filmmakers and held court in his most earnest tone of voice to convey just how hard he worked to make his dream a reality, and just how little responsibility he seems to accept for not only its failure, but also for the ruined lives and hollowed-out bank accounts left in his wake. The directors confront McFarland with his own lies, but it’s debatable whether the pay-to-play tactic was worth it, given the film’s own insistence that the man is “a pathological liar.” Almost better is the account of Oren Aks, a former Jerry Media employee who broke ranks with his old company to dish on just how much they all knew Fyre Festival wasn’t what it seemed long before the crisis unfolded. Whereas Fyre gives Jerry Media and Matte Projects a wide-eyed defense of “it’s not our fault we worked with a crook who lied to us,” Aks bluntly recounts the company’s inside knowledge, and suggests culpability for not going public the way other Fyre Fest skeptics (like investor Calvin Wells, present in both docs) did. 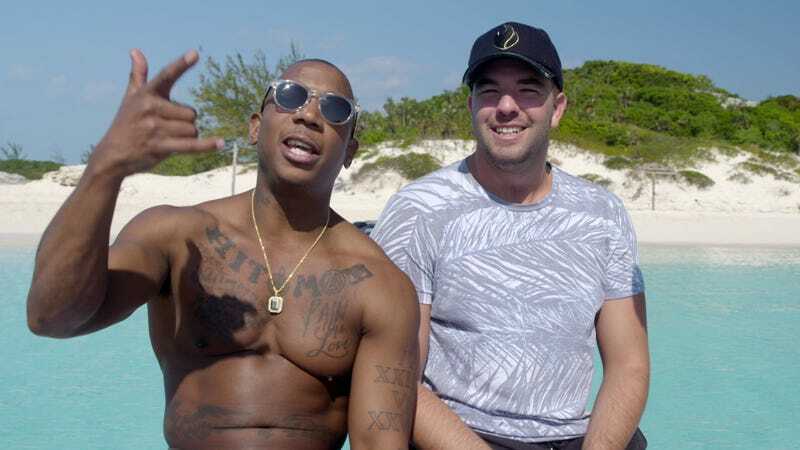 Fyre Fraud, despite its efforts to go after the larger picture, ends up being a frothier and more light-hearted affair, replete with stock photo and cartoon cutaways overlaid with jaunty music cues, overemphasizing the absurdity Fyre has the confidence to know is hardwired into its narrative. Yet it does serve the useful task of demonstrating how the Netflix doc is a cautionary tale about noting who pays for a story to be told. Fyre is the stronger, more worthwhile documentary, but its counterpart is a helpful reminder that, like so many stories, one account can’t contain the whole truth.